A lot of people still enter mortgages thinking that their home mortgage insurance premiums will only be required by their lender for a few years. In the past that was true. Prior to mid-2013, most home lenders only required MIP (mortgage insurance policy) coverage on home purchases for the first five years as long as the loan to value average was at 78% or better. Now, however, FHA requirements make it necessary for lenders to continue home loan insurance in many cases as long as the loan is in force even on 30 year mortgages. This can make a big difference in cost over the term of the loan for home buyers. The total amount of MIP cost over the loan is determined by the type of FHA loan you obtain. Make sure you ask your lender how long the loan you are applying for requires MIP payments. In the early 1900s, the government saw the need for lending policies that were fairer to the average American. Following the depression, it was nearly impossible for American families to obtain mortgages to purchase a home. The Federal Housing Authority was formed to provide better standards and insurance to lenders that the risks of a loan would be covered as long as they met the minimum requirements determined by the FHA which were typically far more lenient than a lender’s application requirements. For over 80 years since its creation, the FHA has made buying homes possible for Americans in all income brackets. By offering more flexible loan guidelines and keeping interest rates low so that all home buyers could manage monthly payments, people all across the nation were able to have the pride of home ownership. FHA loan guidelines give home buyers better opportunities by letting them purchase homes with low down payments of as little as 3.5% and credit scores lower than any bank. Most home buyers can still obtain a home mortgage even with a credit rating as low as 500. There are also excellent options for home owners looking to improve their existing homes or buy properties in need of repair with the FHA 203k loan. This is a construction loan that gives home owners and buyers extra money for improvements at better interest rates and lower costs than a standard mortgage and construction loan combined. There is occasionally some confusion amongst new home buyers when it comes to the FHA. The FHA does not actually issue mortgage loans. It isn’t possible for a person to go to the FHA and apply for a loan. Instead, you go to your local bank or home loan lender and make your application for an FHA backed loan. 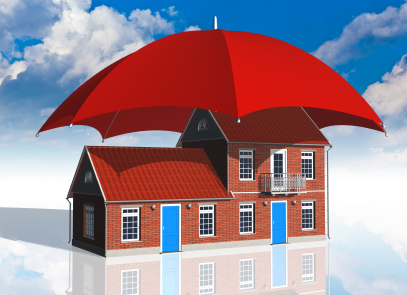 The FHA is set up to offer your chosen lender insurance on a loan that meets the FHA standards. The FHA is the largest home mortgage insurer in the world, and most home loans for both first time buyers and repeat home buyers with low credit scores are FHA applications. Even though they are a recognized name in the mortgage industry, and people have taken advantage of their home loans for decades, the new mortgage insurance policies have had an impact on the popularity of FHA loans. The premiums are more expensive now than they were five to six years ago. With a few exceptions, borrowers can pay a 1.75% MIP closing cost fee and a yearly insurance fee that is divided into 12 monthly payments attached to the loan payment every month. Even though new MIP regulations have made FHA home loans slightly more expensive than in the past, they can still be a very good idea for new home owners. However, there are several government backed agencies that offer mortgage insurance to lenders, so the FHA isn’t your only option if you aren’t in a position to take advantage of those mortgage policies. Along with the FHA, other home mortgage insurers include the VA who gives veterans many great options for home loans at affordable rates and terms. The U. S. Department of Agriculture provides home loans to rural home owners looking for properties in primarily agricultural areas. Fannie May and Freddie Mac also offer special loans for those who qualify. While the special insurance offers are wonderful for those that qualify, anyone who is not a veteran, looking to move into rural areas or can’t meet the Freddie Mac or Fannie Mae qualifications will still need to consider FHA. FHA loans cover a far wider spectrum of home buyers. Most people in low and middle income brackets qualify for FHA assistance. Even many high income home buyers need the help of the FHA in today’s economic climate. FHA loans cover many types of housing purchases as well. They offer great loan offers on single family homes up to 4 units, have lower loan point payments, and also give home buyers the ability to get loans with low credit scores in the 500s, down payments as low as 3.5%, non-occupant and co-borrow loans, loan assumption provisions giving subsequent buyers the ability to buy into the existing loan. Those are all very attractive stipulations that make FHA loans very attractive. The FHA also allows sellers to contribute to the closing costs of a property up to 6 percent, which is a great help to buyers. Along with the streamline program which makes it easier to get refinancing for equity value, the FHA is a good choice for most new home buyers. The common term for the new MIP terms is “FHA mortgage insurance for life.” This leads home buyers to think they will be paying mortgage insurance premiums until the day they die, even when the loan is paid off. That is not true. The “for life” part of the term relates to the “life” of the loan. It simply means that as long as the mortgage is in force, the MIP payments will be applicable.